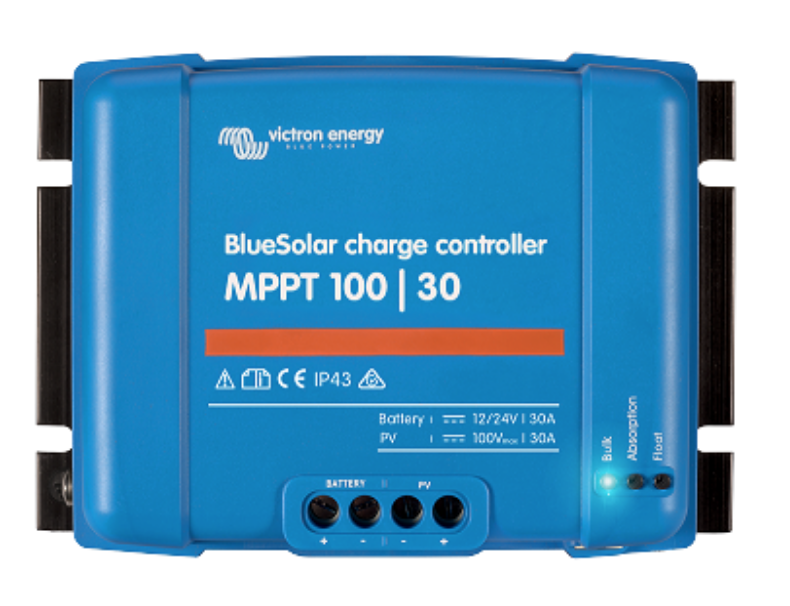 We grabbed a Victron MPPT 100/30 solar controller for the solar panels UPDATE: we’re updating this to a Victron MPPT 100/50 solar controller. We’re working on acquiring the solar panels from Renogy. We’ve selected the Renogy Eclipse 100W 12V solar panels for their efficiency. We’ll be putting 4 of these panels in a series parallel configuration. 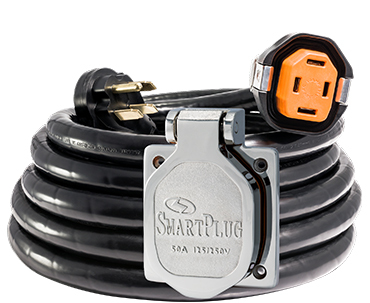 We’ve been working with Smart Plug for our shore power plugs and power cable. We have an entire post coming up soon on this, but what Smart Plug has done is amazing. We’ll post more soon, but we’ve gone with the 30’ 50A stainless steel cord set from them. We’ve been planning out the layout for the system. There are a few things to keep in mind while figuring all of this out. Starting at the roof, between the solar panels and the roof junction box we’ll be using 12/2 copper wire. The amps here shouldn’t exceed 8A or 9A considering we’re using 100W panels in series/parallel configuration. Between the junction box on the roof and the charge controller we’ll bump up the wire to 10/2 to accommodate the extra current at 16-20A. 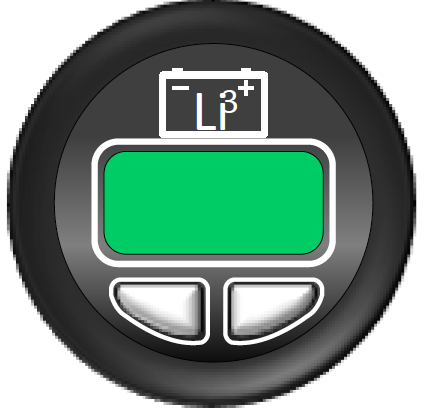 The charge controller, solar controller, and lithium ion battery should be within 12-24” from each other. This is to reduce the line losses at relatively low voltage (12V) and high amperage. We’ll use 2/0 gauge wire for this. 2/0 gauge wire is about the thickness of your thumb and super pricey. We’ll stash all of this under the dinette or the front couch she we have good access to everything, can vent it, and so we have enough room for all of the components. Lastly, we’ll use the Smart Plug system noted above to bring shore power into the Airstream. The shore power will go directly into the charging system of the Victron Multiplus and then branch out to the AC panels. The first AC panel is for the inverter panel and will generate 110VAC from the 12V lithium ion battery. The second panel will only be energized when we are connected to shore power or are running off of the generator. The shore power cable will plug into the generator to recharge the batteries or to run the A/C when we’re low on battery power. The second AC panel will also connect to the 110VAC side of the refrigerator so we don’t have to burn propane when shore power is readily accessible. We’re super interested in getting feedback from those of you that have designed solar systems in the past. Please feel free to reach out to solar@wallytheairstream.com with any comments you may have! We’d love to hear them! We’ve gotten some great feedback from the folks at Airforums.com and have updated our schematic layout for our electrical system! We’ve added a Victron Color GX controller to keep everything organized, updated the MPPT controller to a 100/50, added a couple switches and fuses in some important places, and added a Victron BMS 712 to control the charger. Great stuff here and awesome feedback! You can follow the full thread here if you’re interested in some great reading! Two fun items for Wally came today! Two really fun things for Wally were acquired today. 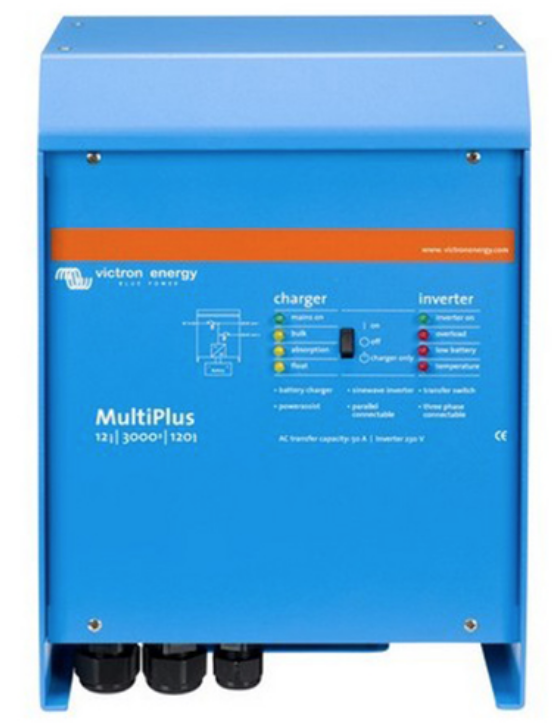 First, our Victron Multiplus Charger/Inverter came! The Multiplus is the brains for the electrical system for Wally. It is a charger in that it takes input power from the supply sources (Solar cells, shore power (30/50A), generator) and charges the batteries for off-grid power. It is also an inverter in that it takes the 12V power from the batteries and provides up to 3000W of running power in AC for the outlets and 110 VAC appliances. Now, it does all of this in a really smart (read: expensive) way. I'm sure that you're all assuming, "Duh, you can probably monitor all of this power generation/inversion/charging via bluetooth and a cloud based app". You'd be assuming correctly, so I won't talk about that. 😀I'm sure there will be many posts around this as I get closer to installation. I'm just happy to have this monster in my possession. You can find more details about the Multiplus here! Here we detail and blog the progress of the Airstream remodel of Wally the Airstream. Wally is a 1959 28’ Airstream Overlander. Thank you for signing up for our newsletter! We hope that you find it entertaining at the least! We won’t bombard your mailbox. You can expect 1 newsletter post from us per week!